My only interest in this book is that I, as an American citizen, am concerned about the leadership of our country. The book is captivating for sure, and also plenty disgusting. If half the things Klein describes are true it is a scandal of epic proportions. 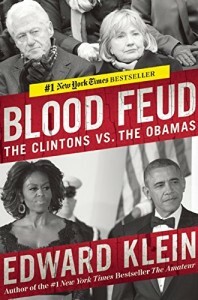 The problem with the book is that Klein gets most of his information about “he said” and “she said” from secondary sources, people who supposedly were in on private conversations between Bill and Hillary or Barack and Michelle. As far as I know there is no way to verify those kinds of things. Of course, they may be true as well as false. The book first gained notoriety for its story that Obama wanted Hillary to invent the story of the video to explain what happened in Benghazi and Hillary refused, so he got Susan Rice to do it. The other story is that Obama had to ask Bill to save his candidacy in 2012 by giving the convention speech. Bill hated to do it because he truly thinks Obama is a terrible president and deserved to lose. Besides, everything the Clintons do is directed toward getting back into the White House. Well, true or not (and I suspect most of it is true), as they say, it is what it is.